Is It A Man, Man? A street means different things in different places; the name changes in character with the place. 42nd Street is so very different from Fleet Street. And these monumental streets are different again to the little municipal streets where so many of us live our lives. And then, there is the old English sense: simply, a paved road. Which is what Watling Street was. 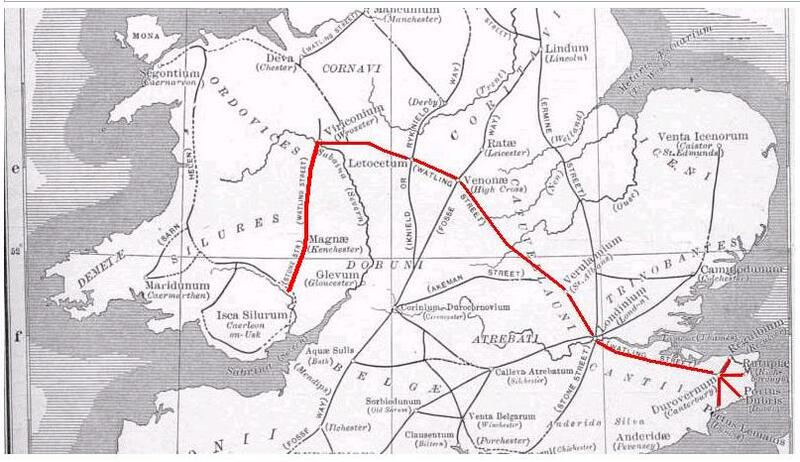 A long route which cut the old England in half, separating the Danelaw – governed by Viking Law- from the rest of England. An ancient British trackway paved by the Romans. Of course: wherever Watling Street wound, there people built things. And left things. And one of those things glares imperiously across a gallery at the British Museum. Its expression has that municipal arrogance and maddening self-assurance which usually accompanies a local bureaucrat. The statue’s gaze is so arresting that tourists milling around the newly reopened Sutton Hoo exhibition just have to tear themselves away to find out who this is, and what is its business there. They dug this statue up just outside the Roman settlement of Towcester, in Northamptonshire; on the side of Watling Street. Archaeologists believe its must have been part of some lavish funerary monument. It is startling because it looks un-Roman. It has none of the perfect proportion of classical Roman sculpture. Scholars point out it is like one of the Roman theatre masks. Perhaps this is a likeness which actually shows British artists losing the skills the Romans brought with them. Or perhaps this is just a figure with attitude. The archaeologists have concluded it is a woman, and with no more than a head to go by, we shall never know for sure. But despite the coiffure, the delicate tendrils teased across the cheek, I’d bet anything that we are looking at a man. They say this head is Roman and British fusion. A melding of cultures, that pompous Roman elegant perfection and the rough earthy perception of a people who lived on a rainy island just off Europe. Perhaps this is why I adore this face from Watling Street. Or perhaps it’s just her – or possibly his – magnetic personality. Posted in Quirks of HistoryTagged archaeology, Britain, British Museum, england, history, Romans, Towcester, UKBookmark the permalink. ” . . . municipal arrogance and maddening self-assurance which usually accompanies a local bureaucrat.” Exactly. On first look, I thought of Ozymandias, but I’ve seen that expression. She–and I think it must be a she–is not a thing of the past. Indeed. This face is the beginning of stories, Elspeth! A woman?! Surely not. Whatever it be, it’s quite alarming with that death stare. Arresting, isn’t he/she? Drew me away from the treasures of Sutton Hoo, and that’s saying something. I’d love to know more about the figure’s provenance. It is a Thing. I love it. On a different note, are you in fact doing your Grand Shrewsday Tour of the Eastern United States this summer? I am beside myself with the possibilities and have put MTM on all sorts of Honey-Do Missions to make our lodgings suitable for your crew. Congratulations on the 444 miles. And the signings. Wonderful stuff: and so much to ponder. The Tour: it is on the cards. Felix id pushing for two weeks with sea and sand in Greece, Maddie is malleable, the two of us want, after all you have written about it, to see Charleston. I shall keep you posted. I think a film based on this statue should be made, Kate, with Timothy Spall in the lead. You nailed it, Virginia. It is Timothy Spalls Romano-British ancestor. The face reminds me of Robert Morley playing a peevish banker or Victorian orphanage warden. Think of that face and that’s probably what Oliver Twist was looking at when he asked for more porridge. I’m with you, Penny. Outrage. Perhaps someone disturbed him during a dressing-up session. It’s a classic, Jim. I read it a very long tme ago. Time for a revisit, I think. You know the eagle which inspired it sits in Reading Museum? Tossed away on a scrapheap at Silchester. I found it entrancing, Jim. The way they mix artefacts with the old sagas and verses, putting each object in the context of its time. And nothing can prepare you for the moment it opens out into a huge hall and you see the boat. We’ll worth the hefty £16.50 entrance fee. My big bugbear? No photos. I never remember anything unless I take photos. I was the one annoying everyone by taking notes on my phone next to the cases…..
With the mortice hole in the base I’m guessing this was fixed in place on a roof as an apotropaic device, a Gorgon to scare away evil spirits. Like the lion-maned bearded Medusa on Roman Bath’s temple this seems to fuse Roman elements with Celtic (the lozenge-shaped eyes, for example). Striking image though! I remember posting a pic sometime on MyNewShy. Ah, yes, the dramatic mask, Chris: perfect for warding off everything, including evil. Phil was talking last night about the feeling that the old skills the Romans brought along were slipping away even as she was hewn out of stone. I still think she’s a bloke. “street”(also skreet in da hood) – a place in far too many decaying American cities where thugs, dope and crime rule the night and crooked politicians rule the day. I’m sure she is a woman – probably a schoolmarm. I had one like that. She has spotted a delinquent, and is about to throw the chalk with unerring accuracy.